Hey Billy, check out all of these great goat stuffed animals. Stuffed goats and plush goats are running all over the place here at StuffedSafari.com! Read more. We have stuffed billy goats and stuffed mountain goats and we know what you're thinking, "why are there plush mountain goats in the farm animals section?". Well Billy, way to be curious and intelligent just like a goat. The answer is that it's just easier that way. Sure, billy goats and mountain goats aren't technically related but a goat by any other name is still a goat. Same goes for stuffed goats. Maybe the plush mountain goats can help the plush billy goats with their climbing skills or tell them cool stories about sleeping on rocky cliffs. Or maybe the stuffed billy goats will teach the stuffed mountain goats how to be a little more domesticated. Either way, they all get along fine and our stuffed animal farm has something that other farms don't; mountain goats. 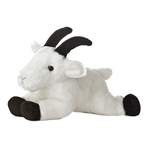 Scroll down to see all of our goat stuffed animals and give us a call if you have any questions. We'll help you get a stuffed goat without getting your goat! Shop.